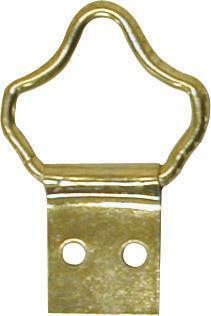 A D-Ring is a piece of picture frame hanging hardware and is used to attach to either side of a picture frame to tie picture hanging cord or wire to in order to hang the picture. D-Rings come in a variety of styles to suit different applications and colours to suit different tastes (nickel plated, brass plated, bronze plated). Standard D-rings come in 1 hole and 2 hole variety. 2 hole D-rings are slightly larger and made from slightly heavier duty metal than 1 hole D-Rings and are used to hang heavier frames. D-rings are usually placed about 1/3rd of the way down the picture frame on each side. They are attached by pan headed screws which can be different lengths depending on the depth of your moulding. If you put a 13mm screw through a 12 mm moulding then you will end up punching through the picture frame face which would obviously not be a desired outcome, so choose your screw lengths wisely! The D-Rings can come in standard size, or small sized to suit smaller moulding widths and smaller frames. Another form of D-ring is the solid ‘D’ D-ring which is made from one solid loop (stamped metal) ‘D’. The sold loop may give extra security in some applications. 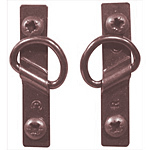 Standard D-rings are formed with the ‘D’ made from a non-continuous looped D of metal. You can also get Fancy loop D-Rings (is that still classed as a ‘d’?) which are used purely for artistic effect, but require small pins rather than screws for attachment to the frame edges. This type of D-ring is recommended for lighter frames only. Angled D-ring picture hangers are another option. They come in pairs (left +right) and give you the security of a two-screw fixing on all types of moulding, including narrow frames. The angled D-ring hanger is angled to give the correct alignment of the cord or wire and to minimise stress in the frame. In summary, D-rings are by far the most commonly used way to hang picture frames. They can be bought in bulk with multi-packs too. This entry was posted in picture framing information and tagged 1 hole d-ring, 2 hole d-rings, angled d-rings, d-rings. Bookmark the permalink.